The key pieces to creating a sturdy rack for your keyboard that attaches to your drum kit. This Complete Keyboard Rack Setup features a set of Gibraltar's Electronic Mounting Arm Clamps, Super Grabber Adjustable-Length Drum Hardware Extension Arm, Short Mic Boom Arm, and a pair of SC-GPRML Power Rack Memory Locks. Use these select pieces together, attach them to your drum kit, and you've got a sturdy spot to place your keyboard during performances, practice, or even your studio. 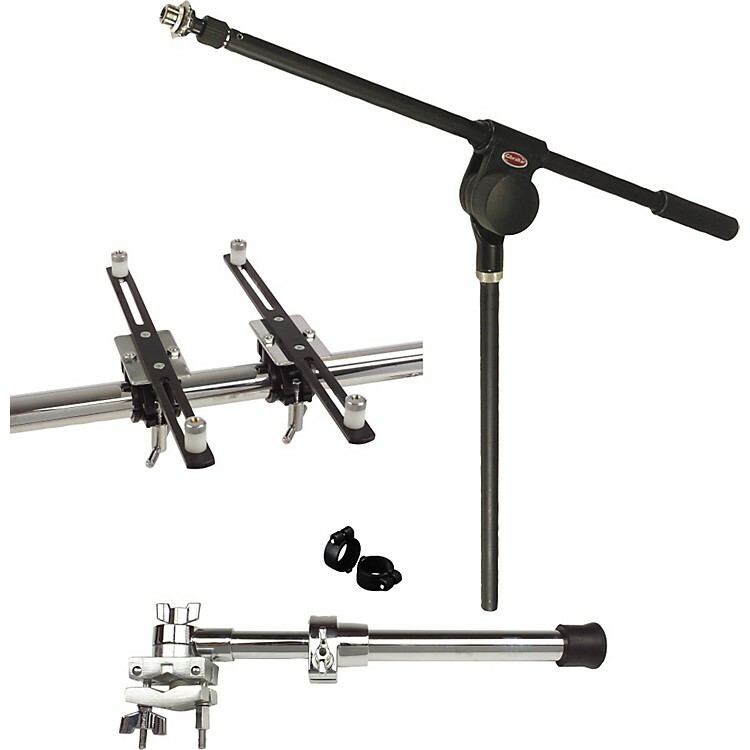 Gibraltar's Electronic Mounting Arm Clamps are an excellent way to mount anything electronic to your drum rack. Sold as a pair, each arm is made of 16-1/2" flat metal stock that is attached to a metal rack clamp with large T handle that fits onto any standard 1-1/2" rack bar. This gives a rock solid mounting surface for electronics or any large item needing a flat surface for placement. Each arm has adjustable and lockable rubber stoppers to hold electronic gear, including laptops and drum modules, securely in place. This extension arm features a 360 ratchet and a clamp that fits up to 1"-diameter tubes with adjustable length. This 19"-long microphone boom arm features a black finish with shockmount. The Gibraltar memory lock works for both the Power Rack and Road Series racks. Its 1-1/2" diameter assures you get the same clamp position on each rack. It's made of all-metal construction. This includes a set of 2.